Coconut Shrimp recipe by bestchefs at PakiRecipes.com. 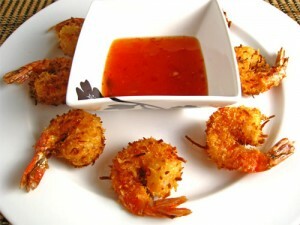 Shrimp cooked with crunchy coconut coating served with sweet and sour sauce. Peel, devein & wash shrimp. Dry well on paper towels. Set aside. In a bowl, mix all dry ingredients for batter. Add 2T oil & ice water. more as needed. Dip shrimp in batter, then roll in coconut. Fry in hot oil until lightly browned, about 4 minutes. To Bake: 300* 5 minutes to finish cooking of the shrimp.